Social change can start right in your garden, or in your fridge. 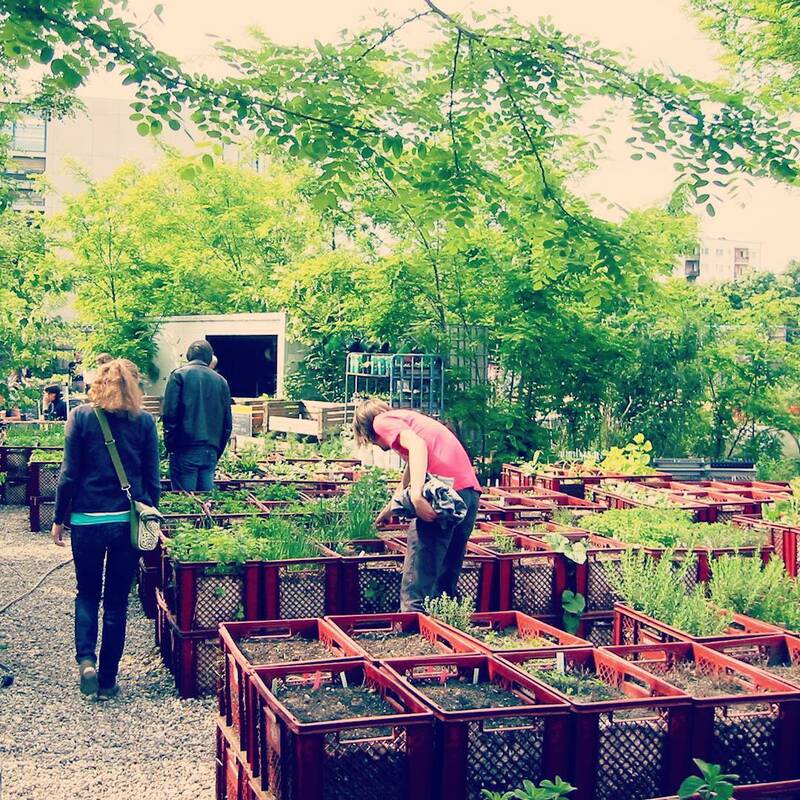 This is the idea underpinning the event “Social Gardens as Drivers for Social Change”, which took place in Prinzessinengarten, Kreuzberg. Edie Mukiibi, (10,000 Gardens in Africa, Slow Food International) was coming to Berlin from Uganda, and this seemed like a good opportunity to gather associations and activists with different projects concerning food and give them the chance to present themselves. Julia Bar-Tal and Rasha Qass Yousef (The 15th Garden), Svenja Nette (Prinzessinengarten), Paula Gioia (Nyéléni, la Via Campesina), Alina Seifert and Johanna Kube (Über den Tellerrand) also took part in this event. Steffen Kühne (Rosa-Luxemburg-Stiftung) was the moderator. This meeting made clear how our freedom is deeply connected to food. Because, easy as it can be, without food we can't survive. This means, at a political level, that starvation is a weapon which can lead people to submission; and economically, that the food market is a coveted one. We are talking mainly about Africa and the Middle East, but first of all history can provide us with many examples of regular attacks on local agriculture during various wars in different places, whether to make the population submit, or to take over the local markets, or both: Julia underlines that the same approach was adopted in Iraq, where the local agriculture was destroyed (the US bombed the seed banks) and where patenting and GMO were forced onto farmers. This is now being adopted in Syria and Afghanistan, taking over local markets; secondly, our rich western food system is based on a substantial difference between people who can afford “better food” and people who are bound to buy junk food thus supporting farmers' exploitation in a dangerous spiral: everything is somehow connected, as the same companies which are grabbing land are exploiting farmers and the aim of all the projects who met that day was to fight against this system. A fight that starts with food sovereignty, a concept regarding a sustainable, long-term process in order to put ownership of food systems into the hands of the communities. This means that communities should be able to manage the food system without being dependent on external sources for seeds and to tailor it according to their own social, cultural and political situation and, obviously, to their needs. This is what 10000 Gardens and the 15th Garden are trying to do, in Africa and Syria respectively, obviously in different circumstances and ways. The aim of 10,000 Gardens in Africa, a project launched in 2010 and widespread throughout the continent, is to declare food independence from corporations – as Africa is now very dependent on corporations for food but can widely feed itself – to protect biodiversity and to establish a meeting point which Africa lacked for so long, creating connections in order to exchange knowledge, ideas and revive agricultural traditions. Furthermore, it is a way to realize that people have the power to change things if they get organized. A similar project is running in Syria; it is named the 15th Garden, as it takes its inspiration from the Syrian revolution on the 15th March, 2011. The aims are connecting people, fighting starvation, and especially fighting starvation as a weapon used by regimes to terrorize people. The NGOs help out with food baskets, but unfortunately this leads to people being dependent on this help, which can be cut by the regime, while the gardening projects, even if they are sometimes attacked by the regime, are a way to produce and share food within the community, guaranteeing a certain amount of food, even if it's not enough yet; defending food sovereignty at times of war is one of the greatest mechanisms of defence to keep a society sovereign also on a political level. Furthermore, it is a way to is organize life at all levels, from medical care to schooling and a network connected to the outside world as, for example, this project is also supported by schools in Greece who produce seeds for Syria. Now let's come back to Berlin. Of course there is no war here, but as I said before there are the same mechanisms of industrial food, poverty and farmer's exploitation. Julia herself is a farmer, and explains that even here in northern Europe, this is a job where both salaries and work conditions are really challenging. Fewer and fewer people want to become farmers, even if there is a counter-movement of people moving to the country to live in a more alternative way. For these people, and for everyone interested in sustainable agriculture, La Via Campesina (part of the Nyéléni movement) is supporting Agro-ecological schools, which didn't exist before in Europe. So, on one hand, it would be useful to grow our own food (or some of it) to loosen the chains of dependence on big companies and therefore to help fight the same fight conducted by 10,000 Gardens in Africa and the 15th Garden. The urban gardens are multicultural places where people can share experiences, knowledge, help each other and understand what is beneath the food we eat everyday. On the other hand, as simple consumers, we can first of all start to pay more attention to what we buy. (Where does our food come from? When and where does it grow? Who are our producers?) and secondly, we can help farmers, for example, through the CSA (Community Supported Agriculture or in German Solidarische Landwirtschaft), where a group of consumers make deals directly with the farmer, in order to grant a certain stability to the latter; this could be done by buying products from this farmer at a certain price for a whole year, or in other ways so as to meet both the needs of the producer and the consumer, and to build a network of farmers to support and protect them, as this is our last chance for food sovereignty. As a conscious consumer I always try to pay attention to what I buy, to eat seasonal fruit and vegetables, and to keep an eye on the companies I am buying from, as I know that making conscious choices is important in trying to avoid exploitation of both farmers and the environment. But what was new for me in this meeting, something I'd never thought about, is how food is so essential to everybody's freedom, also for my freedom here in Berlin, and how there can't be democracy or freedom when companies or regimes can threaten you with starvation; how this could happen everywhere and is actually already happening. How talking about political freedom is meaningless if our liberty can be so easily destroyed by our powerless dependence. And how sometimes home economics can be a political means even more effective than a vote.